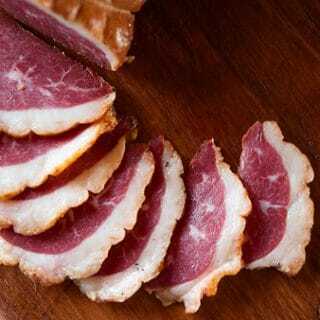 Venison pastrami is one of the great things to do with hind leg roasts. 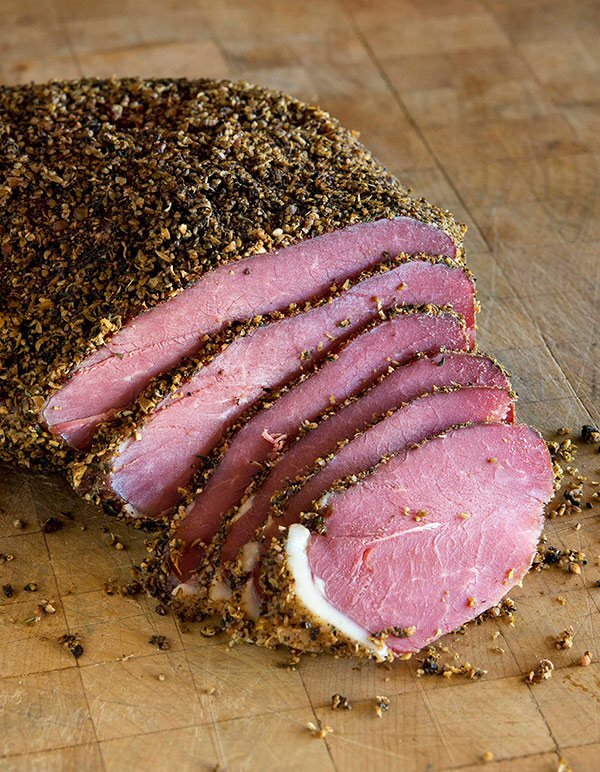 If you’re not familiar with pastrami, or just know it as some random lunch meat, it’s cured, smoked, spiced meat, usually beef, that is often steamed before slicing. 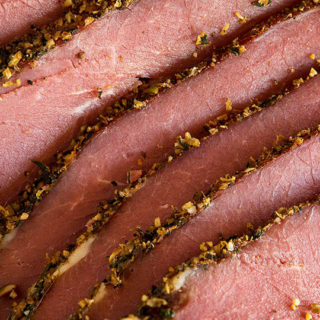 We owe our love of pastrami to Eastern European Jews — pastrami sandwiches are always best eaten from Jewish delis — and variants of this meat exists all over that part of the world. Here in California’s Central Valley, where I live, our local Armenian population enjoys basturma, it’s own version of pastrami. I’ve long made goose pastrami, which was a favorite of Romanian Jewish people back in the 1800s. I like it with Canada goose breasts. I highly recommend that you use a single-muscle roast, ideally from the hind leg, or even backstrap for this recipe, as this is a lean, smoked meat that you’ll end up slicing thin and serving in a sandwich. Set a big roasting pan in the oven and pour boiling water in it so the water is about 1 inch deep. Put a rack in the pan to keep the pastrami elevated over the water level. Ideally you cover this whole shebang with foil to keep the steam in, but you can also just keep the oven closed. It’ll work. 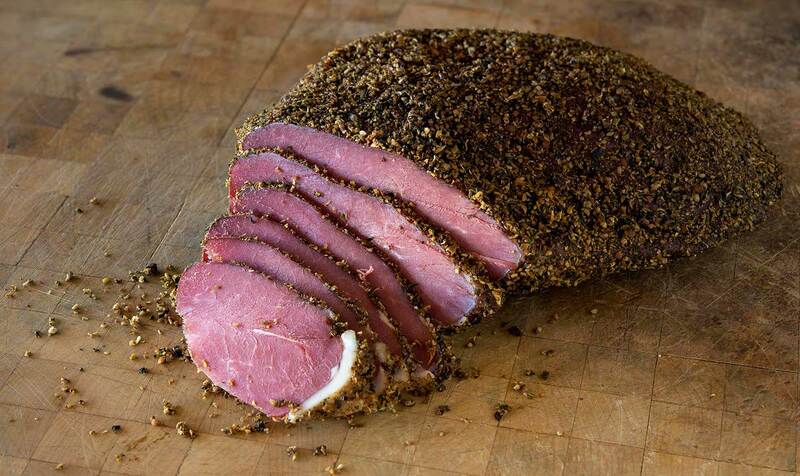 Insert a thermometer into the thickest part of your pastrami and pull it when it reaches 160°F. Let the meat rest 30 minutes, still covered, before slicing. A word on the curing salt. The 3 grams I call for will actually be enough to cure up to about 3 pounds of venison. A general rule is about 1.25 to 1.5 grams of Instacure per pound, but you do need a few grams initially to get things started. Do not use more than I call for, though. Keep an eye on your venison’s internal temperature when you are smoking it. A piece of backstrap can be ready in 90 minutes in a hot smoker, which to my mind isn’t enough time on the smoke. Try to keep your smoker at 200°F or cooler; I like to keep it at 165°F, which lets me smoke the meat for a solid 3 to 4 hours. What wood? Your choice. I prefer oak, maple or hickory for this, followed by walnut, pecan or cherry. Once you make your pastrami, it will need to be eaten within a week or two, or you’ll need to vacuum seal and freeze it. This recipe can be scaled up if you need to. Remember the salt and cure ratio is this: 2% of the weight of the meat in kosher salt, plus 0.25% - that's one-quarter of one percent - of the weight of the meat in curing salt No. 1. Can you skip the curing salt? Yes, but it won't look or taste like store-bought pastrami. Weigh your venison. For every pound of meat, you’ll need 10 grams of kosher salt and about 1.5 grams curing salt. Mix the salt, curing salt, sugar as well as the thyme, celery seed, caraway, juniper and the teaspoon of black pepper and grind them all together in a spice grinder. Pack the venison with this mixture, massaging it into the meat. Vacuum seal or put the meat into a Ziploc bag or closed container and set it in the fridge for 3 to 5 days. A general rule is 2 days per pound of meat. If you’re unsure, leave the meat in one more day than you think you need to. This salt ratio will prevent the meat from getting overly salty. Rinse the cure off the venison and pat it dry. It’s fine if you have a little bit of the cure stuck to the meat, but you don’t want too much. Put the venison on a rack in the fridge and let it dry uncovered for up to a day. Dip the meat into the brandy — or really any other liquid you want — and then coat thoroughly in the 3 tablespoons of remaining black pepper and ground coriander seed. I like to grind this myself so the texture is a little coarse, a little fine. Press it into the meat well. Smoke the venison at about 165°F to 200°F until the interior hits 145°F, which takes me about 3 hours. Let the pastrami cool and eat as lunch meat, or on crackers or whatever. You can find dozens of recipes for smoked meats and fish here on Hunter Angler Gardener Cook! Ben: No idea, but if it were me, I’d be sure to cook it a long time. RE: the coyote question, yes, I should have stipulated that it will get cooked to high enough IT to ensure complete and total trichinellicide, and maybe also par-cooked before smoking for toughness a la venison ribs.